Postcard from Domenico Bacci, to his son Ruggero Bacci, ca. August 14, 1942. The postcard is written in Italian and was sent from Italy (Limano, Bagni di Lucca, Tuscany) where the elder Bacci lived. Domenico wrote on an Italian Red Cross postcard, meant for Prisoner of War mail (Posta del Prigionieri di Guerra). 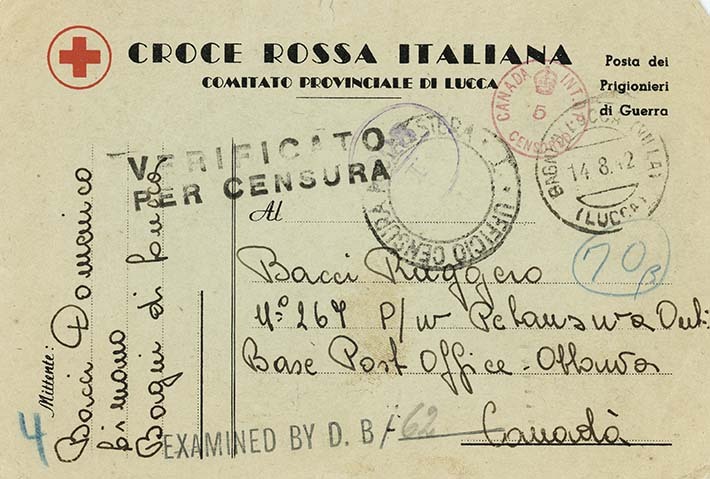 The card has many stamps on both sides indicating it passed through several vetting points, including Italian and Canadian censors. One stamp from Italy has a date of August 14, 1942; another from Canada is dated October 14, 1942, indicating at least a two month period from when it was sent by the father to when it was received by the son. The father writes that after some time he did receive his son's letter. He notes that he is interested to hear of his daughter-in-law and grandsons. He hopes his son is well and that they will see eachother soon.